We give it a maximum of one week before a big-name artist uses an iPad live on stage. Besides being the trendy device du jour, its size makes it a potentially brilliant musical instrument. Here are some of the apps that we can’t wait to start making beautiful music with. [iTunes link] Korg’s Electribe hardware series provided musicians on a budget with an cheap way to get hold of a pro-sounding synth, drum machine, sampler or sequencer. 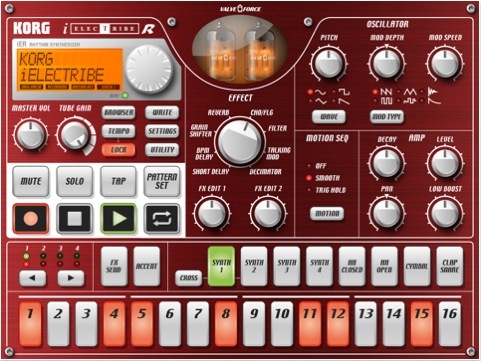 The iElectribe app is a fully-featured emulator of the Electribe-R drum machine. At an introductory price of just $10, this is going to be brilliant for writing beats on the bus or taking on stage for the lightest, thinnest drumkit you’ve ever seen. Hopefully this is the start of a trend for pro music gear being re-imagined on the iPad. [iTunes link] While there are lots of guitars and other stringed instruments on the iPhone, they’re held back by the size of the device. The iPad is much better suited to strumming so this is just a hint at what will be possible one developers have spent a bit more time learning to code for it. Oh, and someone should think about creating a guitar strap for it too. [iTunes link] RJDJ is well known for its iPhone apps that allow you to make weird and wonderful music without any real skill. Rj Voyager is their first foray into iPad territory. The app allows you to manipulate pre-made audio ‘scenes’ using your fingers on the screen. You can adjust all sorts of different aspects of the audio and if it’s anything like the company’s previous work, it will sound bizarre and beautiful in equal measure. If you’re really keen you can create your own scenes using RJDJ’s RJC1000 desktop software. [iTunes link not yet available] DJing on an iPhone might be a bit tricky, but an iPad? That sounds much more of an intriguing prospect. Mixr is one of the first attempts at allowing DJs to work the crowd in a club with just a handheld tablet. The developer promises that the app will offer cross-fading, equalizing, cue, drag & drop tracks, and full effects such as reverbs, auto filter and delay. Mixr – Official iPad DJ App from Noe Ruiz on Vimeo.